First, beware: Do not lick this post, wash your hands after reading and disinfect your computer, I have the flu… With this security advice out of the way, wool, magazines and knitting will follow. I had a very busy week, so not too much ‘hobby-knitting’ for me. The bit of knitting I have done was for an artwork I submitted to a contest. The rest was taking photos and editing them and…. paperwork 😱😱😱 I mentioned this competition several times, but I am too superstitious to write a post about it before I have an (positive) answer. If I get a negative one, I will pretend I never heard about this. 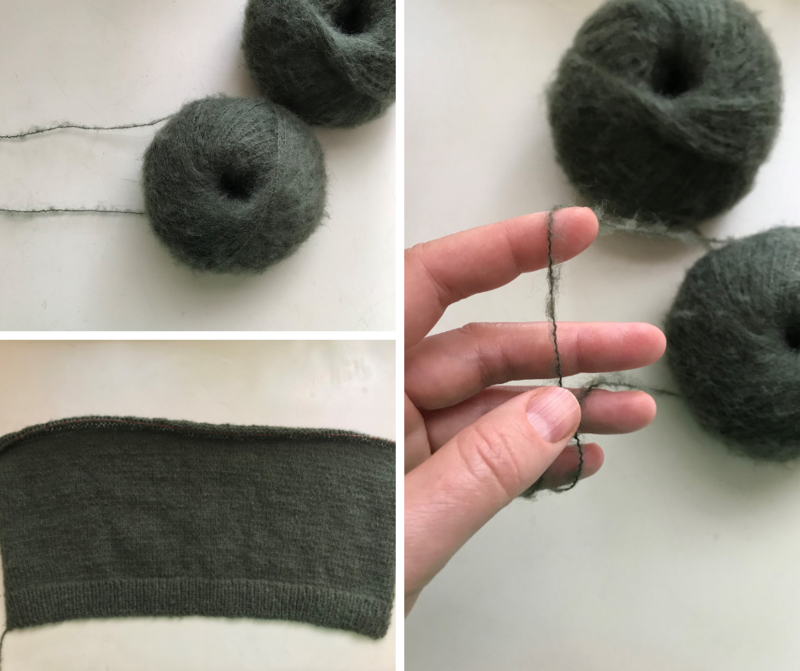 After I sent everything away, my husband got violently ill (and he really seldom is) and my brain was occupied with other things then knitting. But as you can perhaps imagine, I picked this _______________ (insert swearwords) flu up. 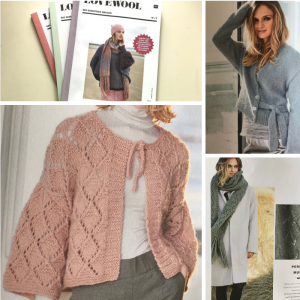 This very long intro was necessary to explain, why I again started a new project 😅😅😅 My mother bought me a knitting magazine to distract me from my headaches and fewer and I immediately fell in love with one pattern: a wide wrap cardigan made from fluffy yarn. As I have never made a wrap cardigan, this was doubly attractive. This magazine is from a German wool shop which sells its own brand of yarn Wolle Rödel and yarn from Rico design. Sadly, the wool for this pattern is much too expensive (in my universe). But I found some cheaper replacement: I tried the same yarn I used for my artworks simply hold double. And I am very happy with it. This yarn I buy on eBay, it is made from rests from the fabric production, meaning it has no label and is mostly very thin as you can see on the photo. The yarn has 380 m for 50 g and I used a 2,75 mm needle. I had/have a few problems to get gauge, because I cannot knit tight enough with thin yarns. But as I said above, I think it will be ok. The big chunk of the back I knitted while watching alternately Star Trek and Sugar Rush. Not sure if this was good for my mental health. We will know in some days. If I start baking aliens in muffin tins, please fetch help…. The magazine has all over nice patterns, but as I know from other versions of this magazine, the sweaters have often very long bodies and super small armholes. Also possible is, that I have a very short torso and thick arms 😅 Hopefully the cardigan will be the right size for me- the pattern calls for 21 cm for the biggest size, this seems to be enough. If you want to see more beautiful projects with yarn, fabric and most of all needles, follow @needleworkmonday. Or even better grab your needles and keyboard and join the #needleworkmonday community. 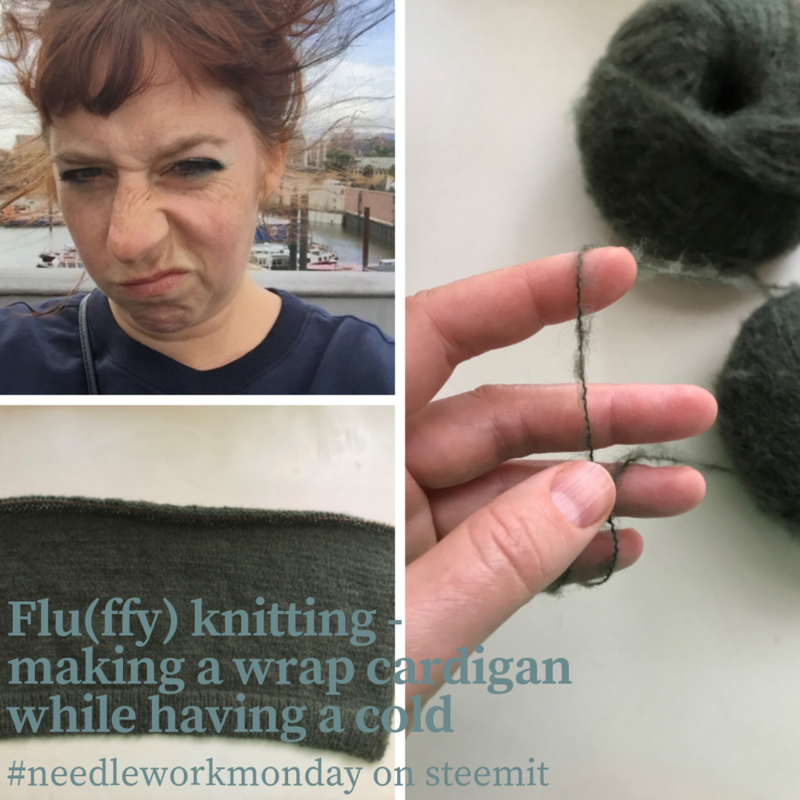 You can read all #needleworkmonday comments on my steemit blog.